1) Using a refractometer to measure final gravity. Refractometers seem to be the flashy new toy that every home brewer wants to have. 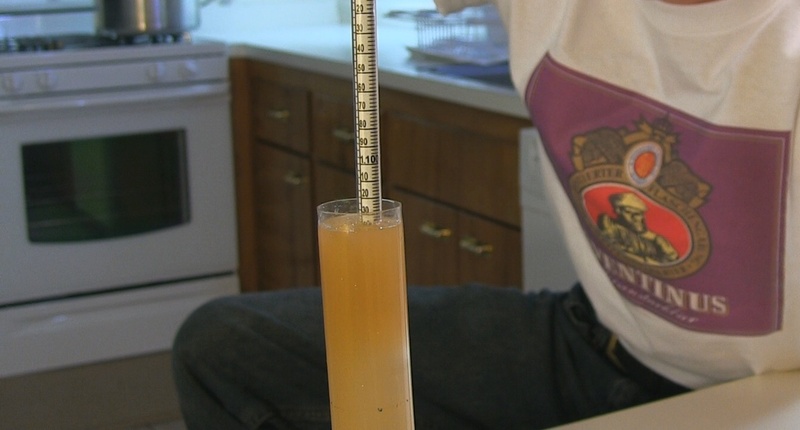 They allow fast measurements of the wort or beer with a sacrifice of only a few drops of beer. However, this tool, if not used correctly, and indicate an inaccurately high final gravity. Alcohol will skew the readings. The refraction index of alcohol is different than that of water, so it must be compensated for when taking a measurement. There are several calculators available online that can compensate this for you. Not all malt extracts are created equal. Studies have shown that some extracts are as little as 55% fermentable. Ray Daniels provides a wonderful description of this in his book "Designing Great Beers"
One day apart isn't always waiting long enough. Beers that have taken longer than 10 days need to have consistent reading 2 days apart to ensure final gravity is reached. There is a whole blog post on this subject. It's very easy to knock a hydrometer out of calibration. I used to be in the habit of just dropping it back in the tube. Eventually I started getting some readings that didn't make sense. I check the hydrometer in water and it was reading 1.005! Lightly dropping the hydrometer can move the paper inside and change the adjustment. If your thermometer reads 150.0 it doesn't mean it's accurate, in fact it could be off by 5 degrees putting you at 155. Also, regardless if it is new, you paid a lot of money for it, or it being analog doesn't mean it's accurate. Check it in boiling water to make sure it will be close at mash temperatures. 7) Mash time too short. Even after conversion from starch to sugar is complete the beta enzymes will continue to break down the long sugar chains into shorter ones. Mashing at 150 for 60 minutes will produce a less fermentable mash than mashing at the same temperature for 90 minutes. To control your wort's ferment ability you will want to add a mash out step at 165-170 to denature the enzymes. If you have highly chlorinated water you might be using Campden tablets to rid your water of free chlorine. Campden may be good at removing chlorine, but it also acts a yeast inhibitor. In fact, it is commonly used in wine and cider making to stop fermentation. Using 1 tablet per 20 gallons will reduce the chlorine and not impede the yeast much. A combination of two of the three will cause the yeast to run out of nutrients and may lead to a stalled fermentation. Yeast require specific proteins to break the longer sugar chains into short chains that they can convert to alcohol. Colder fermentation temperatures are more likely to add to a stalled fermentation, although in my experience, this is rare. rousing the yeast by swirling the fermentor, warming it to 70 degrees and adding corn sugar and yeast nutrients can get it going again.